I’ve just returned from Victoria, BC, where I spoke at the HoweStreet.com Money Expo 2012. The show was smaller than many shows, but the location is beautiful, a major plus for anyone whose spouse doesn’t want to go to Toronto in March for PDAC. I’d never been to Victoria before and hadn’t expected the touch of Old-World charm the place has – it reminded me more of Quebec than western Canada. Or maybe I just had the Old World on my mind, since the Greek elections could well have marked the beginning of the visible disintegration of the Eurozone. As of Sunday night, it seems that Greece will not leave the European Union – at least not yet. It remains to be seen if the slender majority that the pro-EU faction gained in Greece will lead to a coalition government that can actually deliver the austerity program needed to keep the bailout funds coming. For now, the world keeps turning as it did last week. But thinking about the Old World reminds us of one of history’s greatest lessons in hyperinflation, a lesson no one can afford to ignore. 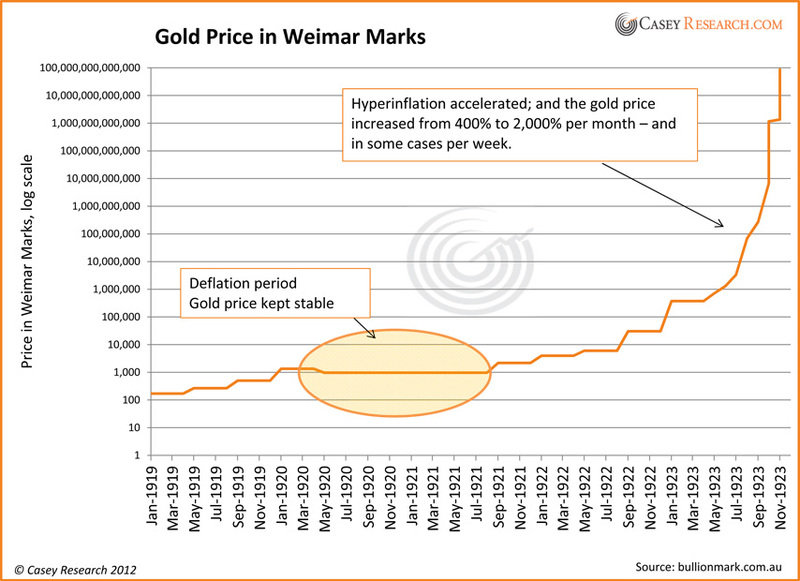 The Casey metals team has a look at gold during the Weimer hyperinflation of the 1920s in this week’s article. Good food for thought. Could the US experience a wealth transfer like the one that wracked the Weimar Republic? While the federal government and most so-called economic “experts” dismiss the notion, the economic data suggest that it’s already started. This example shows how gold can perform during hyperinflation. If that worst case scenario comes to pass, will the example your family’s finances sets be a positive or a negative one? Kazakhstan’s central bank plans to boost the share of gold in its foreign currency reserves to 20% from the current 14-15% level. Last year the central bank bought 5.3 tonnes (0.17 million ounces) of gold, but this year their purchases accelerated, already purchasing 10.3 tonnes (0.33 million ounces). Kazakhstan is one of a number of countries that have been increasing their official gold holdings in recent years. Others include Mexico, Russia, Colombia, and South Korea. Last year central banks bought a record 450 tonnes (14.5 million ounces). Even if the amount of gold purchased by central banks this year ends up slightly less than last year, as some analysts expect, it’s still a big share of total gold demand and lends strong support to the price. Criminal syndicates now consider thefts of gold, silver, and rare coins to be both less risky and more profitable than robbing banks or other well-protected targets. As precious metals increase in price, more and more cases of larceny are taking place. The FBI estimates that only about 4% of stolen precious metals and jewelry is recovered annually. While many investors know it’s not wise to talk about the gold you own, this article shows that that behavior can have dire consequences. Besides being a valuable asset, gold coins can also be viewed as art, lulling the vigilance of the owner. Showing your collection even to friends and family is tempting, but don’t overlook the potential consequences. Learn more about how to safely store gold at home; Jeff Clark offers some good, practical tips. In India, the gold price in rupee terms reached an all-time high of $544.74 (Rs 30,420) per 10 grams. In Mumbai, standard gold prices have risen by 27% over the last year. On one hand, a weak rupee makes gold less affordable, while on the other, it makes it a robust investment asset. Indian ETFs are said to have seen a marked rise in activity, as investors continue to buy the yellow metal as a safe haven and diversification from equities. Assets under management of gold funds in India were $1.83 billion (Rs 102.18 billion) in April 2012. The assets held under India’s gold ETFs nearly doubled year on year. The assets were valued at $981 million (Rs 54.63 billion) a year ago. Recently another gold-purchasing option became available for Indian investors: e-gold trading at the Singapore Mercantile Exchange (SMX). Since its launch on June 1, volume has soared nearly 300%, with US$16 million traded. An exploration stock announced that it received a major environmental permit. Read what we think. Get the latest on your BIG GOLD stocks from the portfolio page.